Q&A with Fr John Flader: What is a Plenary Council? Home Faith Q&A with Fr John Flader: What is a Plenary Council? Question: Dear Father, now that Australia is planning for a Plenary Council to be held in 2020, can you tell me exactly what a Plenary Council is and how it differs, say from a national assembly or some other national gathering. It is not surprising that you are unfamiliar with the term Plenary Council since the last such gathering in this country took place in 1937, before most of us were born. In simple terms a Plenary Council is a gathering of the bishops of a particular territory, along with a number of priests and others, to consider matters of importance for the Church in that territory and to pass legislation on them. Any such legislation must first be approved by the Holy See (cf. Can. 446). The principal reason why Plenary Councils have not been held in this country since 1937, and why they are exceedingly rare in other countries as well, is that the Second Vatican Council gave rise to bishops conferences, in which the bishops of a given territory gather periodically to consider matters of importance and make decisions on them. In this country the Australian Catholic Bishops Conference ordinarily meets twice a year for periods of a week or more to consider such matters. The Second Vatican Council entrusted to the bishops’ conferences a large number of matters to be decided for each territory, and the bishops of this country have met and ruled on them and other matters often over the years. If the bishops’ conference can already discuss and legislate on these matters, why have a Plenary Council? The obvious answer is that in a meeting of the bishops conference only the bishops take part, whereas in a Plenary Council representatives of the clergy and laity can also participate. 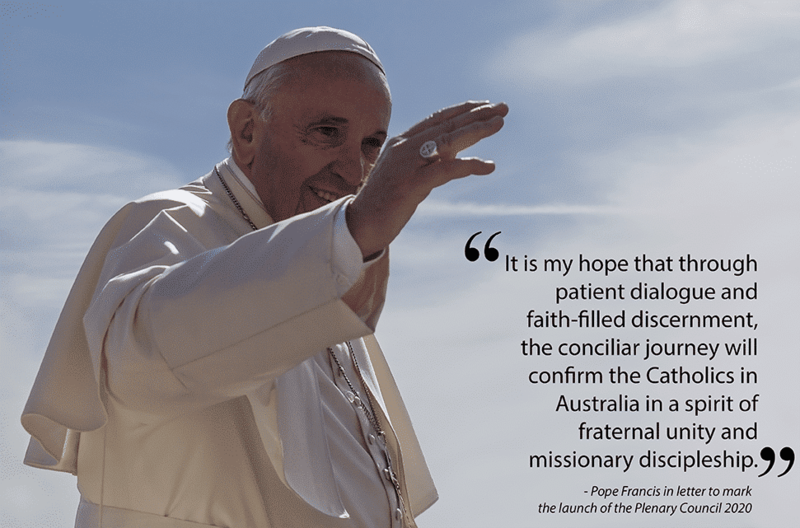 In fact, as the Australian bishops have indicated, there is to be process of preparation for the 2020 Plenary Council in which all Catholics in the country are invited and encouraged to express their views on how they see the Church at the present time and what suggestions for change they would like to see implemented. All of these observations will be gathered and considered before the Council meets in 2020. It is a very important opportunity for everyone to contribute to this Council and it shows how the bishops value the thoughts of every single Catholic. We all have ideas on these matters and now is the time to express them. As to who can actually take part in the Plenary Council itself the Code of Canon Law is very clear. In the first place all the bishops are to attend and it is only they who have what is called a deliberative vote, meaning that only their votes count in passing any legislation (cf. Can. 443, §1). Other categories of persons who are to be called are vicars general and episcopal vicars. Major Superiors of religious institutes and societies of apostolic life of both men and women are to be called in a number determined by the bishops conference. Rectors of ecclesiastical and Catholic universities along with their deans of theology and canon law are also to be called, as are some of the rectors of major seminaries (cf. Can. 443, §3). The vote of all these is consultative, meaning that it is taken into account by the bishops but does not count in passing legislation. Finally, priests and other members of the faithful may also be called, but their total number is not to exceed half of all the others mentioned and their vote too is consultative (cf. Can. 443, §4). In summary, the number of those attending is clearly established and limited, as is the nature of their vote. In this sense, a plenary council is very different from a national assembly, where as many people can attend as the bishops determine. But a national assembly has no power to pass legislation as does a Plenary Council. Let us get involved by making our voice heard in the preparatory phase and let us pray for the fruits of the Council, which can be very important for the future of the Church in this country.